Ting Xie, Ting Xie, where for art thou Ting Xie? Deny thy stroke order and refuse thy shape; or if thou wilt not, but be sworn my pinyin and I’ll no longer be a Chinese student. Clearly, studying has gone to my head and loosened some screws. It has also tightened others– namely, the ones that help me remember the way to write Chinese characters, the same way every time, so that I can produce them on command when I hear them. And that is the essence of “Ting Xie” (聽寫), or in English, dictation (The literal translation is “listen, write”). I have done a little dictation before in French, but this is a completely different ball game. In my Chinese class, we write pinyin (romanized spelling of the pronunciation), tones (1 of 4, or none), and draw the characters. I prepare by looking up every character’s stroke order, and then practicing each character 5-15 times, as well as writing and reading all of the possible sentences and phrases we might be tested on. It is a fairly tedious way to study– however, inexplicably, it works. Preparing for and executing each weekly Ting Xie has helped me seal the imprint of a character, and its sequence of strokes, into my (hopefully) long-term memory. And the key to this for me has been practicing correct stroke order. Each Chinese character has a proper order that one “should” draw it in, to ensure a clear and consistent result, and to help you understand each character’s components and how they fit together. Now instead of thinking, What does that character look like? I think, How do I draw it? Like learning how to play a song on the piano or another musical instrument, my right hand maintains a muscle memory of drawing the character– an imprint of long hours of practice. 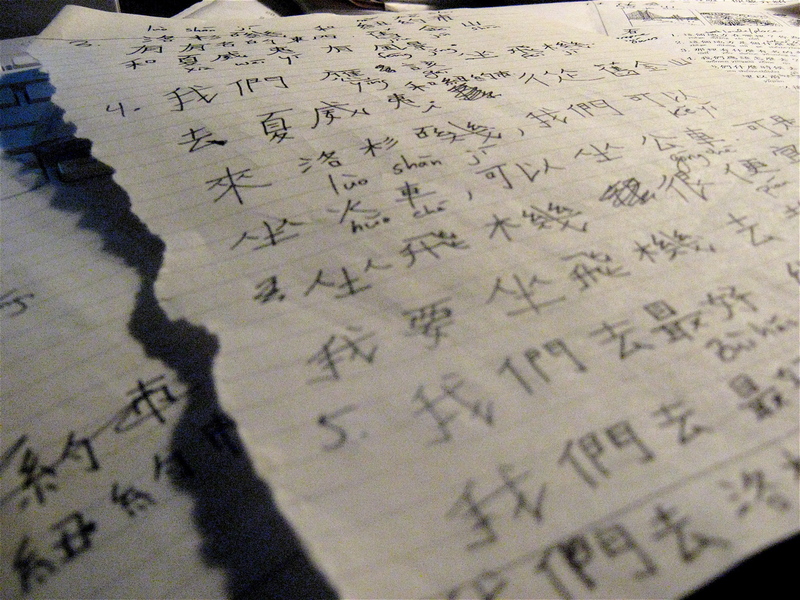 It’s fascinating, really, to have an interesting procedural and visual facet to learning this language– my friend and I often joke that if someone ever cut off our right hands, we’d forget all of our Chinese characters. But it raises the question of how to teach foreign languages– is repetition the only option? Our teacher is great; she also works into the lessons structured speaking exercises, unstructured chat about weekend plans, formal presentations, short quizzes, compositions, and games using the vocabulary. But even all of these fun and richly educational tasks won’t have their full impact on our comprehension without preparation at home. The foundation for learning Mandarin seems to be drilling, because training your brain to recognize and make linguistic sense of characters takes constant practice. And so it falls to us Chinese students to somehow drill ourselves in character writing, patterns of speaking, tonal variations, and grammatical structures–with Ting Xie as one of the most blunt yet accurate tests of how well we do that each week. As time goes on, I’ve found that the more I can drill at home, the more I enjoy class: I can focus on nuances of usage and syntax, rather than spending valuable time trying to decipher vocabulary words. The many facets of our Chinese class have also led me to think about language pedagogy more broadly, and how I might improve the way I teach English and writing when I return to America. Though it’s been a year or two since I taught Freshman Composition at Emerson College, I do want to teach writing again. Certain facets of teaching composition are controversial among the academic set, like whether or not to explicitly teach and test grammar, how formulaic academic writing should be, and what kinds of prompts encourage students to think critically not only about texts but about the nature of their language. Granted, this is teaching English to native English speakers, but everyone needs to learn fundamentals of linguistic communication in order to use them successfully. Not that I am suggesting we implement dictation in college freshman English classes, but my experiences in Chinese class have reminded me that mechanical tools are important in any language setting. Without adequate tools, one’s creative and critical exploration of a new language can only go so far. Also, I would love to hear from English teachers living abroad and/or teaching ESL or TEFL in English-speaking countries– what are some tactics to teach English to non-native speakers? Does English have an equivalent to the Chinese Ting Xie— a practice that reinforces some of the really important basic mechanical skills required to succeed at learning English? Or for that matter, when teaching and learning another language? That’s the reason I spent lots of time writing my chinese homework when I was in elementary school. At that time, we had to write each characters at least ten times! Nice to meet you at dinnertime. I’ve read your article. No worries about learning to love writing Chinese character even though they look hard to draw. The words you wrote in the middle of this article seem cute and natural. I think all you have to do is to continue practices of writing and keep the character shapes on your mind. BTW, I can read Chinese both in simplified and traditional. The word – Love – which in traditional Chinese is ‘愛’ but unfortunately in simplified is without a heart of its body so that the meeting seems quite different. I think more characters you learn, more differences you’ll find and more interesting you’ll get. Enjoy your life in Taiwan and thank you for sharing good Taiwan articles to everyone in the world! Thanks for the comments, ladies! 袁開 (is that right? Or is it Kai Yuan? ), you’re completely right about the character for love– it IS simplified and I didn’t even realize it! This is a good lesson that I need to pay close attention when I find Chinese character images– for this post, I just wanted to have some examples of stroke order to illustrate the point for Americans who have never tried to write characters. But a version of love without the 心 (heart) does seem completely different, and empty of its core meaning! It was great talking with you and Yitzu over dinner, and learning some great new phrases, words and patterns– I’m going to study from the iPod audio recording we made! And I look forward to more conversations speaking (almost) only Mandarin. 星期快了! I enjoyed reading your “Ting Xie” article above. I’m the father of a 6 1/2 year old boy, David (Wen Long, “Scholarly Dragon”), in Portland OR. I’m a white guy, and my wife, Bonney, is 1st-generation Chinese American. She speaks Cantonese, Toishonese, and Mandarin, and can write Chinese characters. We met as teachers in China (1996-98); we were located in Changchun and in Shenzhen. Our son is enrolled in the Mandarin Immersion Program here; it is half-day all in English, and half-day all in Chinese, every day. He began in kindergarten, and is now in 1st grade. He loves it, and we love that he is in the program. I came up with the idea of coordinating an event at his school that would be the equivalent of the (English) spelling bee. At first I called it the “Hanzi Bee”; now I’m thinking of calling it the “Ting Xie Competition”. Do you know if this has been done before as a school event? If so, could you refer me to the website, person, etc.? If not, can you suggest any general tips that you may have in terms of how to bring this into being? I am most grateful for any help you can give me. Kimbelina! well now, the ESL world went and got its knockers in a twist over how to teach students to write decades ago. Basically because we’re obsessed with the idea that our writing has to correspond to sound in some way. But actually English orthography might have a lot more in common with Chinese: it’s morphemic, not phonetic. In the UK a couple of guys have been teaching dyslexic kids to write English as collections of morphemes, (I know this because my dad reviewed the book) and they were inspired by Japanese. Its an interesting thought, because English, like Japanese has a double register of vocabulary which alternates mainly between Latin/Greek French and Anglo-saxon. Imagine English were written in Kanji. Imagine two characters that when put together use their greek readings, but seperately use their regular english ones. then mind doctor and psychiatrist would be written exactly the same. Further if you knew that psych meant mind and iatr (doctor) and ist (profession) you can then also decode a whole other bunch of words. Basically I think it would be really good if you had a text where the morphemes of each word were colour-coded. then you could learn the smaller blocks of english much faster rather than having to learn a whole new word each time. therefore he must be pay a quick visit this web page and be up to date daily.